This July has been all about treadmill runs at the YMCA (thank you free child care) and racing my way back into shape. Since the Firecracker 4 on July 4th I’ve done 3 races: 2 track miles and the Roller Coaster Race 10k. Our local running club, HMRRC, hosts free track meets on Tuesday evenings in July. I hadn’t been to one since I was in high school, but I wanted to take Emma to run in the kids race and figured I’d hop into a race while I was there too. I surprised myself by running a 5:23 for the full mile. Emma ran the 50 meter kids race, although she kept running through the finish line and didn’t want to stop. That weekend we took a quick trip up to Lake George, where we stayed at the Great Escape Lodge (the host hotel for the Roller Coaster Race). It was a nice hotel, and the kids loved the indoor water park. It was convenient for race morning too because we were able to just jog from the hotel to the start line, and then run back after the race to shower. The race itself went pretty well- I’m not usually a fan of 10ks because they just seem so long but this course had a lot of twists and turns, so you really had to pay attention and couldn’t zone out. I ended up running 39:58, which wasn’t bad considering my lack of workouts lately. We spent the rest of the day at Great Escape and Splashwater Kingdom (tickets were free with the race entry). Emma had the time of her life on those rides! This past Tuesday I hit the track again for another mile, this time a few seconds faster (5:16). Emma and her cousin Mia ran the kids races again. We’ll be in town for one more track meet next Tuesday, so I might break out the spikes and see if I can get under 5:10! We’ll be in Lake Placid this weekend for IMLP to cheer on my brother-in-law for his first Ironman! I’ve never spectated an Ironman race, so this will be a fun new experience. I’m not sure what to expect of an all-day endurance event (what do we do? will there be beer? where will my kids take naps? )… I’m still at a loss trying to figure out how anyone could swim and bike for hours BEFORE running a marathon. Badass. A quick recap and Roller Coaster Race giveaway! Training has been very, shall we say, “relaxed” recently. After months of structured marathon training, I welcomed the recovery with open arms. 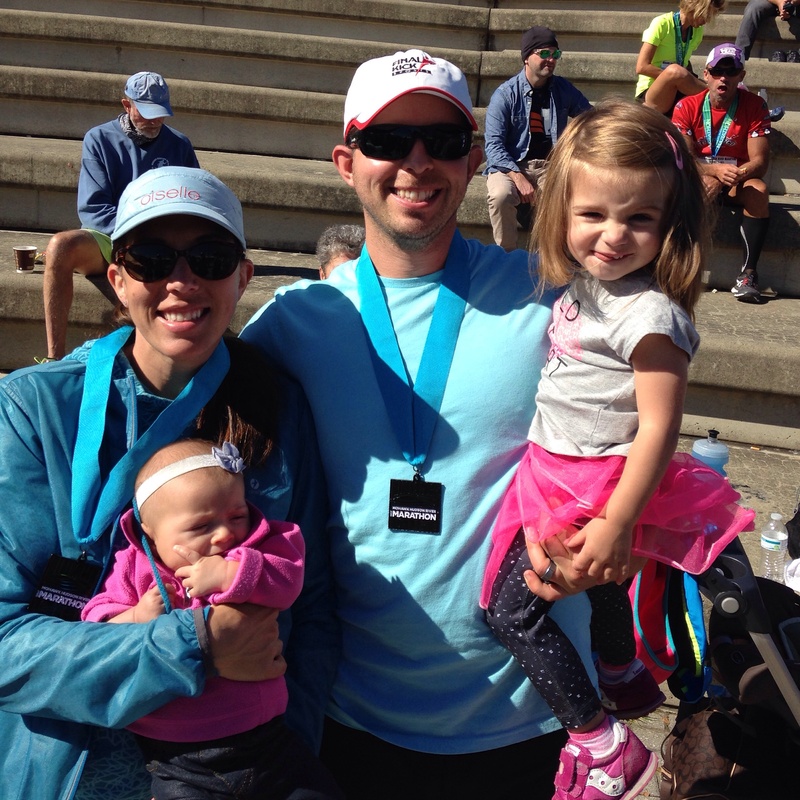 It started with plans to take it easy for a few weeks after the Rhinebeck Marathon, and then all 4 of us got hit with a round of chest colds and ear infections, and no one slept through the night for the entire month of June. Let’s just say we were a cranky group. My local team, Willow Street Athletic Club, was planning to run the Firecracker 4 on the 4th of July (this past Monday). I was in the middle of organizing Natalie’s 1st birthday party on July 2nd, so I was hesitant to commit to running it (never mind the fact that for the past 7 weeks I have averaged 10 miles per WEEK). But I knew I could run 4 miles, so I decided to just go for it and I’m so glad I did. I went out faster than I planned, and paid for it big time in the last mile (which happens to have a huge hill that I almost walked up), but in the end I still managed to run a decent race and finish just under 25 minutes averaging 6:15 (6:05, 6:08, 6:24, 6:27 woof)*. After the Firecracker 4 with Mia and Emmaline! Okay, all that being said, I found myself looking for more races to stay motivated over the summer and one race stood out as a MUST do- Roller Coaster Race at Six Flags Great Escape in Lake George. I told Pete about it, and he thought it looked fun (and it’s hard to impress him with running). They have a 10k and 5k option as well as a roller coaster challenge that you can do in addition to the race OR by itself (if you’re not a runner) for a special medal. Plus the rides open early for the race participants and you get a ticket to Six Flags Great Escape and Splashwater Kingdom with your entry. I kid you not, the next day I woke up to an email asking if I’d be interested in doing a blog giveaway for this exact race! To enter, just comment below and tell me your favorite roller coaster (or 2 or 3 if you can’t decide). Share this blog post on twitter and tag @molliedeturner and @runorriderace for another entry. Make sure you follow me @molliedeturner and follow Roller Coaster Race @runorriderace so we can see your tweet! Share this post on Facebook and tag me for another entry! You can enter the giveaway through Sunday night July 10th at 8pm EDT** and I’ll announce the winner on Monday morning. Disclosure: I did receive a free entry for this race, but I was planning on registering on my own anyway. I paid for a registration for Pete as well. All opinions are my own! *this is not the way to run a race, positive splits are BAD! Hey, it’s been awhile! I won a race this weekend! I’m still in lazy mode after Boston, so I wasn’t sure how this would go. We left our house around 8 am on Sunday and got to Schenectady Central Park around 8:30. No alarm necessary since the girls have been getting up at 5:30 am lately. I warmed up 1.5 miles with my sister, very easy, then nursed Natalie before walking over to the start. Reluctantly did one stride and waited a few minutes for the race to start. I don’t know if there was a gun (I think the starter just said GO!!) but once the race was off I went straight to the front. Usually I don’t care if I start off easy, but since there were a lot of young kids in this race (which was awesome, go Girls on the Run) I thought it would be better to just get out. The race made a small loop back through the starting line and then looped around a lake in the park. There was one woman ahead of me in the beginning but I passed her in the first mile, and after that I ran alone. I came through the first mile in 6:03 (side note: why does Garmin show different splits than Strava and sometimes different distances?) I felt pretty good so I decided to maintain the same effort. The course went up and over a medium-sized hill and then turned left into the woods where we ran along a trail with some uneven footing (although it was well marked). I came through two miles just as we ran back out of the woods and saw my split was 6:13, so I had slowed a little with the hill and uneven footing, but I still felt pretty good. The third mile looped back around the lake in the opposite direction, and I tried to quicken my pace a little on the back half of the loop. I completely zoned out after that and before I knew it I was at the third mile marker (5:58). Then I looked up and saw my family cheering for me and the finish clock- I didn’t have a big time goal for the race, but it’s always nice to get in under 19 minutes. My official finish time was 18:47 (results here). After the race I ran an easy mile with my sister as a cool down. I was planning on running another half mile with Emmaline during the kids race, but she decided not to run (it was pretty cold and windy). I’ve been reeeeally enjoying NOT marathon training- probably a little too much. I won flowers and a year membership to a local gym. Totally didn’t get a photo of the awards because I had the post-race shivers and just wanted to peace out and get some food. We had brunch after the race at Perecca’s Italian Kitchen (they make the BEST bread) which was awesome because we were starving. They put sprinkles on Emmaline’s pancakes at our request. Yum! Well, friends, I was hoping for a better result on Patriot’s Day this year. I didn’t even come close to reaching my goal, but I finished. I had to be transported to the med tent in a wheelchair, which was not something I ever imagined happening. But let me go back to earlier in the day. My sister Steph (19 weeks pregnant) and I (breast pump in tow) were laughing at the hashtag she created #breastpumpsandbabybumps and attempted to figure out a vague timeline for the morning on the bus ride out to Hopkinton. When you look at the schedule for race morning, it seems like you’ll have so much time but in reality the time goes by really fast. All we really did was wait in line for the porta potties and then it was time to go to the start. I didn’t have any trouble finding the operations tent where I turned in my pump. It didn’t bother me, but I did think it was comical that they put a bunch of guys in charge of that area. It was a lot warmer than I had expected in Hopkinton. Apparently it was 70 degrees at the start, clear and sunny. I started coming down with a cold on Friday night so I already had a sore throat but I noticed that despite how much water I had been drinking my mouth felt dry. That was my first sign that I might have to adjust my goal. After you leave the Athlete’s Village, it’s about a mile jog/ walk to the start line. Before you go into the corrals, there is an area with a bunch of porta potties where everyone makes their last pit stop. The lines were long and I knew I wouldn’t have enough time to get through before 10 am. A bunch of guys were lined up along the embankment next to that area and I though “well, that’s not fair” so I marched myself along the row, kept my eyes down, and peed. Only got a little on my shoe. I made my way to my corral and looked around to see if I recognized anyone. Nope. The sun felt really hot at this point and I was glad I had decided to wear a hat. A few minutes went by and I sort of spaced out until I heard someone call my name. It was Meg, another runner that I know from social media. We figured out that we both had similar goals so we decided to run together. The race started a few minutes later, and I was so damn excited to get going. The first mile is a really steep downhill. We were towards the back of our corral and one of the last corrals in Wave 1, so it was tough to hit pace (although somewhat expected). The first mile was around 7:15, and then it started to spread out enough to weave through the crowds. The next three miles were all in the 6:50’s, which was encouraging except for 2 things- 1) my Garmin was already way off the mile markers on the course, and 2) I wasn’t feeling “good”. I tried to ignore those issues though because I know it’s normal to go through rough patches in the marathon (although not usually this early on). We chatted briefly about how we were feeling and decided to settle into the low 7’s for awhile. At this point I knew I wasn’t going to hit my A goal, so you can only imagine what was going on in my mind. Of course I was disappointed, but I also knew going into this training cycle that Boston weather is totally unpredictable. I really had three main goals for this cycle- 1) to get through it without a major injury like I had 2 years ago coming back from my first pregnancy, 2) to run a PR in the half, and 3) to run a PR in the marathon and hopefully closer to 2:55- 2:59. So, knowing I already had met 2 of 3 made it a little easier to let go and back off the pace. Although there were a few slower miles, we stayed in the low 7’s for the most part through Ashland, Framingham and Natick. Wellesley was a nice boost- my Oiselle teammates came out in full force at Cowbell Corner (there were almost 100 of us running Boston) and I got to see my family there and hug my girls. According to my watch I came through the half around 1:35 but was getting further and further off the mile markers. I had separated from Meg by then, so getting to see some familiar faces was awesome. Don’t remember which mile this was, but I was still feeling good here. I still felt pretty good through the first of the Newton hills and had a smile on my face even when I was hurting. I noticed somewhere in Newton that my right quad and the front of my hip had tightened up, so I tried to relax a little bit and just focus on getting up and over each hill as delicately as possible. I was tempted to join the walking party since it seemed like so many others around me were doing it, but I knew if I started walking now it would be hard to fight it for the next 6 miles… so I smiled up Heartbreak at 9:00 pace. Nearing the top of Heartbreak Hill. From the top of Heartbreak to the finish the streets are lined with people cheering. It’s such a strange experience because you’re exhausted, your legs feel like jello, and every ounce of you wants to stop running (or at least somehow skip forward to the finish line). But you’ve got friends and strangers cheering for you and telling you to keep going… and somehow you will your legs to keep going. I felt myself starting to get emotional, which led me to start hyperventilating so I had to try to disassociate in those last few miles. I counted from 1- 100 focusing on taking deep breaths. Then I’d start over again. I did this for 6 miles, with a few breaks in between. I looked up and saw the Citgo sign, then looked down and started counting again. I looked up when I heard someone cheer for me by name, then I’d get back to counting. It felt like I was barely picking my feet up but in reality I was still running around 8:30 pace for the last 10k through Brookline and Boston. Running through Chestnut Hill area and Boston College. Before I knew it, we were turning right on Hereford! Both times I’ve made that turn it has caught me by surprise…. like, this can’t be the finish already?! But, there’s only one right turn into Hereford, so it has to be the end. Then we turn left on Boylston and you can see the finish line. Without thinking, my turnover got quicker- I just wanted to get to the finish. I see you, finish line. I remembered to stop my watch this time. My official finish time was 3:24:57 for 26.2 miles. I had another hyperventilating episode at the finish but I was able to calm myself down, then slowly walk through the finish area along Boylston and pick up my gear bag. This is when things got a little ugly…. I was dehydrated and not thinking straight. I had to find the operations tent to pick up my pump, but I couldn’t remember any details about where it was (they transported the pump from Hopkinton for us to the finish, unlike our gear which was dropped off at the same tent where we picked it up in Boston). The volunteer who I spoke with wasn’t helpful- maybe I wasn’t being clear, maybe I just picked the wrong person to talk to, but I felt myself start to hyperventilate again and then I started seeing stars and things got black for a moment. A kind volunteer brought me a wheelchair, and since I wasn’t confident I could walk on my own at this point they wheeled me to the med tent. They used a scanner on my bib number as I went in the tent and then took me to an area for the less serious ailments. There were signs over each section, and I noticed one that said “Leg Cramps” which made one of my legs instantly cramp up. I laid down on a cot with a blanket, tried to eat and drink water. A nurse came to take my blood pressure, and a doctor came over to ask me questions and make sure I was okay (like how many marathons have you run, was this your first Boston, and a few others pertaining to how I was feeling). My breathing was still labored at this point but much better than it had been. The staff and volunteers were all incredibly helpful and talked to me until I felt better. It took about 30 minutes before I sat up and realized I was fine. They brought over someone with a cell phone and I was able to call my family and let them know I was okay. Once I was cleared to leave, they scanned me out and I met up with my family. I wanted to get a photo with my two girls after the race, but Natalie had me pinned down and Emma wanted to play hide and seek with her cousins. So, you get the idea. I was pretty sore yesterday, I think partly because of the hills and also from sitting in this position for an hour and a half after the race. Poor girl was hungry. I plan on taking two weeks completely off from running and then will go from there. I was lucky I felt good enough to finish and get a qualifier for next year. Maybe the third time I’ll get it right. I’m extremely excited to run shorter distances this summer and then go for a fast half marathon in October, and as of now I’m not planning to run a fall marathon. A huge hug, high five, and thank you to everyone who offered support these last few months and on Monday. My mom, dad, sisters, and Pete all helped watch the girls on weekends and sometimes on weekdays so I could train. Thanks to my Willow Street teammates for your words of encouragement and support on the course yesterday, my Oiselle teammates who had such a freaking awesome cowbell corner in Wellesley and along the course, and the Averill Park alumni cheer section (Mindel, you really are everywhere). Over and out for now, friends. Boston, I love you! Hard to know where to start with this one. I read this article in the VA pilot on my way home Monday night and I think it really sums up the overall conditions for the races on Sunday. The article describes the start of the race where we really had no idea what lay ahead of us. That part was so true. I left my hotel room in shorts and my singlet with an old throwaway fleece (carrying my dry bag) and as soon as I got outside I had to return to put on more clothes. I realized that I wasn’t prepared for the conditions, but I just laughed and shook my head. There wasn’t anything I could do about it. The warm up was probably worse than the race itself: dark, pouring rain, alone, and straight into the wind. I heard the national anthem playing when I knew I still had about a half mile left, so I was a little worried about getting to dry bag trucks, taking my extra clothes off, etc and getting to the start before 7 am, but I made it. The energy before the race was more relaxed than usual, almost like everyone was just at the IDGAF stage. When the race started, I was literally weaving around people wearing trash bags. I’ve seen that kind of thing before races (never worn one myself… I usually opt for throwaway clothes) but never during. My plan for the race from my coach was to run 6:40s through 8-9 miles and then try to pick it up for the last few miles if I felt good. The more detailed version was that the first 8-9 miles should feel more like a tempo effort, and the last 4-5 should feel more like a race. With the forecasted winds, I decided my best bet would be to not worry about my exact pace and just focus on keeping a tempo effort. I was hoping for a pack to run with to help break the wind, and after the first mile I found myself running with a pack of about 10 other runners. First 3 miles were into the wind and mostly in the 6:40s (splits for the race are here). Just before the 3 mile split we turned onto Shore Dr. and the change of direction (and being a little inland with some tree protection) made the wind a non-issue for the next three miles. Most of our pack took off and I found myself running with Mary at what felt like a comfortable pace. We hadn’t planned to run together but we ended up running the remainder of the race pretty much stride for stride which was a stroke of really good luck (and a lot of fun). As we turned right into the gates of Fort Story, I prepared myself for what I knew would be the strongest wind gusts of the day. I’ve been thinking about how to describe the conditions at this point. Somehow the winds were coming straight at us AND sideways. Some of the gusts were so bad that they felt like they’d blow us over. There were volunteers standing out in the worst rain and wind handing out cups of water and gatorade, and I almost couldn’t believe it. There was a runner pushing a stroller for Team Hoyt as part of the race running under 7 minute pace into the wind just ahead of us, and I was in awe knowing that even 9 minute miles with a stroller are hard. My legs were numb, my hands were numb. I kept looking down at my legs to make sure they were there. I didn’t look at splits in Fort Story because I was afraid they would be way off pace. When I saw the gates leading us out onto Shore Dr./Pacific I almost cried knowing that the wind would soon be at our backs. Somewhere in the last 3 miles I knew I was going to have a good race. I started to gain some feeling back in my arms and legs and decided to try to take my soaking wet arm warmers off. I took one off and felt like I dropped a pound. The other was under my watch, and I took a minute to figure out how the hell I was going to maneuver this feat with numb fingers. I decided to just carefully take my watch off, remove the arm warmer, and then put the watch back on my wrist. Except I couldn’t feel what I was doing at all. So my watch slipped out of my useless fingers onto the pavement and I saw it happening in slow motion thinking “noooooooo”. It took me a second to stop and pick it up, but that kind of jolted me back into the race and I got back on pace immediately. My watch stopped when it fell, so my splits were off after that… but this ended up being a good thing because I didn’t bother to look at the splits and instead just focused racing. Mary and I were still running together and passed a few other runners along the way, but neither of us were worried about place. I was starting to get tired, but knowing that I only had a few miles left I just let myself race and go to the pain cave. My last two miles were 6:24, and 6:10 (I didn’t know that during the race but noticed it later when I plugged in my Garmin). I saw the finish line clock as I was approaching and was almost confused when I saw 1:26, and then I kicked in the last .1 and crossed the finish line. My official chip time was 1:26:21 and I was 10th female. I reeeally didn’t want to do my full cool down but ended getting it done and finishing with 20 miles for the day. I’ve been feeling pretty good since Sunday, with 4 easy days on the training schedule but a 24 miler looming ahead this weekend. I’ll have some more thoughts about Shamrock and my marathon training coming up soon. I started writing an actual recap, then Emma got up mid-nap to hand me her hair clip and my post disappeared. So you can thank her for sparing us all the boring, overly dramatic details. I went out too fast, then I slowed down, then I got a ton of energy in the last mile and managed to pick it up for the last 1.1 miles. Both kids are up now, so that’s all I’ve got! Feeling good! Three weekends, three races, and finally I’m feeling a little more like myself. 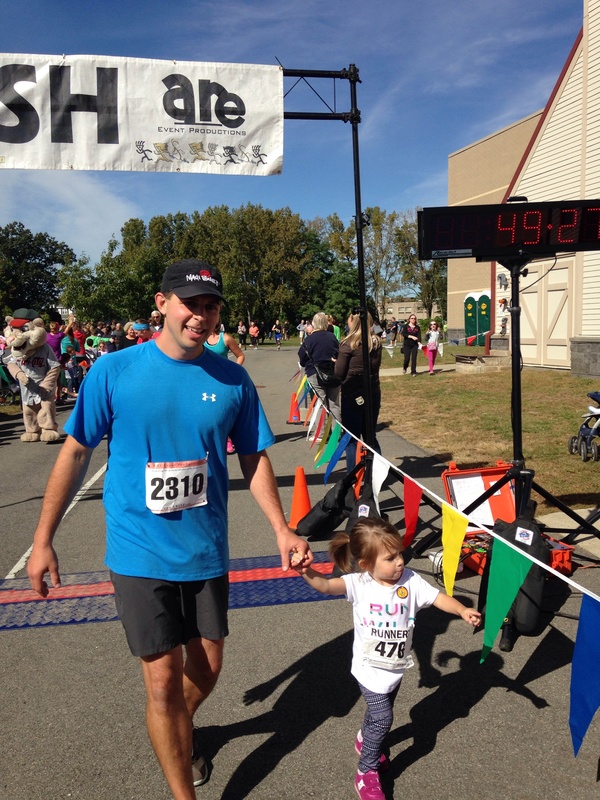 This past Sunday I ran a 5k in Colonie. 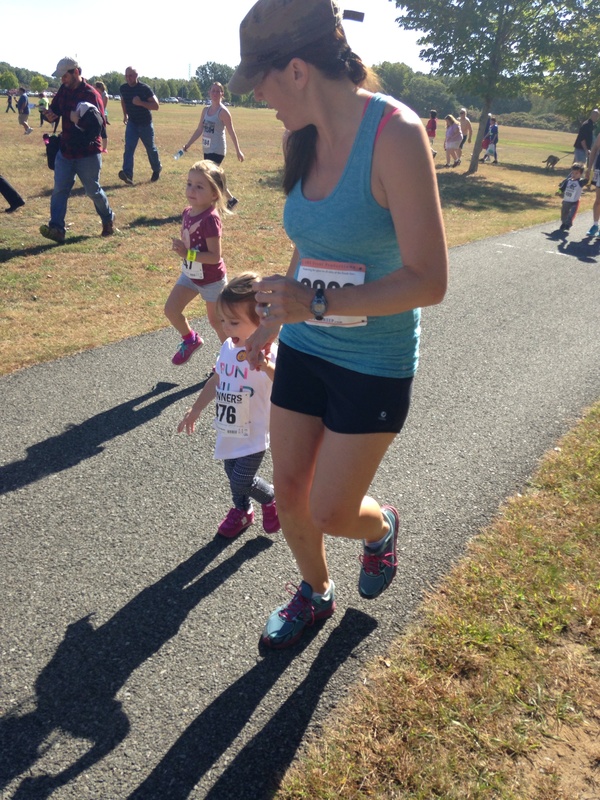 I chose this race because there were kids races and activities and it looked like a fun fall activity for the family. The weather was gorgeous- a little warm for running purposes but perfect for spectators and kiddos to enjoy the day. My warm up was a jog to the start line plus a little more, maybe a half mile total. So, when the race started I felt sluggish and slow, but I managed to find a pace that felt ok and stuck with it. My first mile was around 6:30, and I came through the two mile point at 13:06 (so a 6:36, yay math). I was struggling at this point but then realized “hey, you’re not sucking!” I knew I only had a mile left, and though part of me really wanted to stop and walk, the other part of me saw a woman up ahead who I could catch and that kept me going. So with about 1/4 mile left I summoned whatever fast twitch muscle fibers I could and was able to catch her and cross the line in 2nd place. My overall time was 20:30, so I did slow a little in the third mile (I didn’t take splits during the race, but guessing the last mile was around 6:42). Still a trend of getting slower each mile, but not nearly as dramatic as the 5k I ran 2 weeks ago. Afterwards I met up with my family and got Emmaline ready for her race. She was really into it this time and ran almost the entire 1/4 mile by herself. Running with Emmaline in the beginning of the kids race. The last kids race she participated in was about the same distance around a baseball field and she got scared by the mascot so we had to carry her most of the way. (He scared me too).